What The Powerball Cash Could — And Couldn't — Buy : The Two-Way It's a big chunk of change. You could make the next two Star Wars movies! But it's not Koch Brothers big. It's not saving-Miami-from-climate-change big. It's not buying-BuzzFeed big. 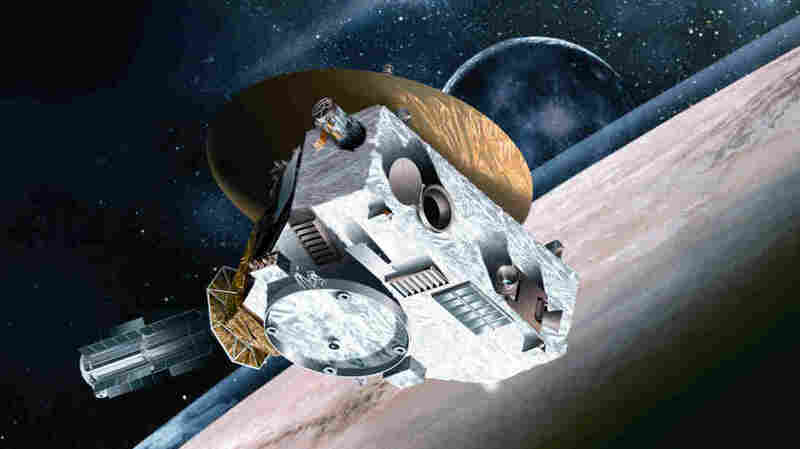 Sending a probe to Pluto — based on the cost of the New Horizons probe — would be out of your budget. So ... have you bought a Powerball ticket? And yes, $1.5 billion is a lot of money. It's a lot even if you take the smaller cash payout — $930 million — instead of the lifetime annual payments. It's a lot even after you account for taxes: If you live in a state that doesn't tax lottery winnings, once you pay Uncle Sam, you've got $561.72 million. It's a big chunk of change, for sure. But if you win, there are some things that will still be outside your budget. For instance, you could make a lot of political donations. You couldn't buy Koch Brothers-level political influence. Early last year, industrialists Charles and David Koch announced their network's budget for the 2016 election cycle: $889 million. But no one said this face-off would be fair, and the fact is, unless you've invested a lot of time and energy into cultivating a network of deep-pocketed donors of your own, it's your Powerball prize up against that Koch empire. And your $561.72 mil — while impressive — doesn't get you there. You couldn't pay the interest on America's national debt for even one day. In 2015, the U.S. paid $218 billion in interest — less than expected, thanks to low inflation. That's $597 million per day. How about some international comparisons? You could buy the entire economic output of Dominica ($524 million). Or Tonga ($434 million), or any of the six countries with GDPs beneath $400 million. You couldn't purchase the economy of Comoros, or the 184 other countries on Earth. Never heard of Comoros? It's an island nation in the Indian Ocean with a population of fewer than a million people and a per capita GDP of about $816. And it's out of your price range. Still, that's eight countries whose GDPs fall short of your new net worth! But the richest people on Earth are in a whole 'nother league. Bill Gates, with an estimated net worth just shy of $80 billion, has more money in his pocket than 129 countries handle in a year, all the way up to Cuba and Sri Lanka. Mark Zuckerberg, who with his wife, Priscilla, plans to give away the vast majority of his fortune, could purchase the full economic activity of Bolivia with his $33 billion. Feel more like investing in property? You could buy the nine most expensive properties sold in New York City last year. The 10th-most expensive pushes you over the limit. Still, that's enough luxury condos to have one for every day of the week, one for your in-laws and one just for show. You couldn't buy the world's most expensive home. Antilia, the Mumbai residence of Mukesh and Nita Ambani, cost a cool billion to build. Want quantity over quality in your real estate purchases? You could buy every single-family home in St. Louis Park, Minn.
All the houses in the suburb of Minneapolis, combined, would go for $559,819,936, according to Redfin in 2014. That would leave you nearly $2 million — for furniture, perhaps. You couldn't buy the town of Cheverly, Md. At $561.76 million total, the 6,000-person town just outside D.C. is barely out of your price range. Meanwhile, the Walton family of Wal-Mart fame could buy every home in Seattle, Redfin says. Warren Buffett could snap up Charlotte, N.C. And Rupert Murdoch could purchase Peoria, Ariz.
Want to move the needle on national security issues? You could fund the fight against ISIS for 51 days. You could maintain the U.S. nuclear arsenal for 24 days. In late 2014, the Los Angeles Times wrote that maintaining the arsenal was set to cost $8.3 billion in one year, or $22.7 million a day. You couldn't pay the full cost of the U.S. military for even one day. The total U.S. military budget is more than $600 billion per year. That's $1.6 billion per day. Your Powerball millions get you about eight hours of funding America's military. You could pay the total health care costs of 64,469 Americans for a year. The Peter G. Peterson foundation estimates the U.S. spends $8,713 per capita on health care — twice as much as the average developed country. You couldn't cover the cost of the waste in the U.S. health care system for one day. Not even close. At an estimated $750 billion of waste per year, your newfound wealth would cover about 6 1/2 hours. Space exploration more your style? You could send a probe to Mercury. You can't afford New Horizons. The NASA probe that just flew by Pluto cost $700 million. You could buy The Washington Post. Jeff Bezos purchased it for $250 million in 2013. It's valuation is well north of $1 billion. Fancy being the next big-shot producer? You could personally bankroll Star Wars Episodes VIII and IX. Episode VII cost around $200 million to make, and the next two were originally estimated to be in the same ballpark. But they could be significantly more expensive and still stay in your budget. You couldn't remake Pirates of the Caribbean 3 and 4. On Stranger Tides was the most expensive movie ever made, north of $400 million by some estimates. At World's End was $300 million. Together they price you out. On a more serious note, half a billion dollars is nowhere close to enough to address global climate change — you'd need trillions and trillions for that. But curious if you could help just one city grapple with the changing climate? You could keep the city of Miami Beach dry for 40 years. You couldn't save Miami Beach. If you'd like to use your Powerball cash to keep Miami Beach from drowning, and you've dropped a half-billion dollars on powerful pumps, congratulations! You've just gotten started.
" ... even Mayor Philip Levine, the biggest cheerleader of efforts to 'rise above' sea level rise, would acknowledge that pumps alone represent a temporary fix — a 30- to 40-year buffer. If future projections hold true, more roads will have to be raised — along with buildings — as the rising sea pushes up through the porous limestone sponge underlying much of South Florida. First floors might have to be vacated, rusting infrastructure replaced, codes and building elevations dramatically beefed up." Your remaining $60 million-$160 million will be gone before you know it. The total price tag for keeping Miami Beach will be in the billions, the Miami Herald says. And that's just the island of Miami Beach. Miami itself — and all of Miami-Dade county — is also in trouble. As Elizabeth Kolbert wrote in The New Yorker last month, estimates for sea-level rise due to climate change range from "more than 3 feet" — that's the Intergovernmental Panel on Climate Change's number — to up to 30 feet, according to the chairman of the University of Miami's geological sciences department. The average elevation in Miami-Dade County, Kolbert notes, is 6 feet above sea level. A previous version of this post incorrectly said the U.S. military budget comes out to $1.6 million per day. It's actually $1.6 billion. A previous version also conflated Miami and the city of Miami Beach in some sections.